I’m sharing my launcher for Format Factory and a guide how to make portable package. - Launcher makes Format Factory fully portable. - Supports relative paths (Output folder,...). - Automatically backups/restores configuration files. - Integrates Format Factory Portable into shell (Send To option). - Extract 'FFP_Launcher.zip' to location of your choice (USB,...). 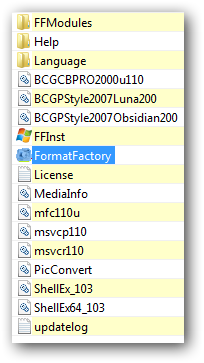 - If you have already installed Format Factory, copy all folders and files from the installed location into Format Factory Portable -> FormatFactory folder in your portable package. - If you do not have Format Factory on your computer, download the installer into Format Factory Portable -> Update folder. Run the launcher and follow wizard instructions. Note: This method requires admin rights. Use 'FormatFactory(P).exe' in Format Factory Portable folder to start Format Factory Portable. Download the installer into Format Factory Portable -> Update folder. Run the launcher and follow wizard instructions. Note: Installing update requires admin rights. 'Settings' file (Profile folder in your portable package) holds Format Factory Portable's settings. Launcher backups Settings file automatically. To restore Format Factory Portable settings from backup, delete 'Settings' file. To create new Format Factory Portable settings backup file, delete 'Settings.bak' file. Launcher integrates Format Factory Portable into shell: adds Format Factory Portable option to Send To menu. Send To menu option is always available while Format Factory Portable is running. Format Factory is my preferred tool for the video converting job, mainly because it offers deinterlacing and adding video logo options. Only one thing I'm sad about: it doesn't support DXVA, so it's much slower on my system than Freemake Video Converter (which adds a watermark at the end of every longer than 5 minutes video, by the way, starting with version 4.0.4 IIRC). joby_toss wrote: Thank you very much for this! You are very welcome and thank you for sharing your thoughts. without need to install Microsoft Visual C++ 2005.
installing Microsoft Visual C++ 2008. FF doesn’t require Microsoft Visual C++ 2005 to run (XP 32-bit, 8.1 64-bit). I have tested format factory V3.1.1 it dose not run without vc which version you have tested ? My suggestion: try the latest version (3.3.1.0). 3K3 wrote: My suggestion: try the latest version (3.3.1.0). Thanks the new version works without vc. I've always found Format Factory to be mediocre at best. It tries to do everything but ends up doing nothing particularly well. The difference becomes obvious when using other, specialised tools and comparing it to FF's output. The program is also unstable and finicky when handed large jobs. kuihdez wrote: any other suggestion ? For a good "all-in-one"-type converter program? No. Not that I can think of right now anyway. That's the territory of FreeStudio and other "Free [task] Converter" developers. Format Factory and the like are intended for quick-and-dirty converting. They're meant for people who don't want to fiddle with complicated settings and download/learn/use many different programs. In that they do well. But if you care about quality, then by all means look around the database (and other sites). You'll find gems like TEncoder/TAudioConverter, AvantiGUI, XnConvert, Faststone Photo Resizer, ImgBurn, AnyBurn, MediaCoder, Pazera Audio Extractor, Freac, XMedia Recode, ImBatch, SUPER, etc etc. All of these and many others specialise in a few tasks and do them well.